In the vicinity of the cafes in Paris’s 11th neighbourhood, there’s well, you know, graffiti. Notable is the stencilling and spray work from Paris veteran street scene, Miss.Tic! What I like about Miss.Tic’s artwork is her choice of location. The work tends to cat-lick exterior walls of cafes and restaurants, almost exclusively – a seal of approval or a straight critique on consumption? These days the cafe owners take patronage of the works protecting them from being ‘buffed’ over. The piece in this ‘spot’ though got given a protective perspex shield. 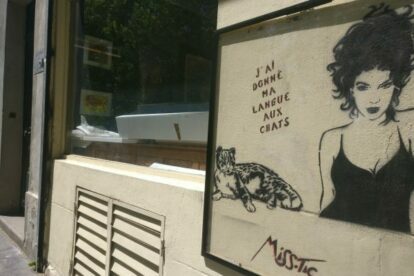 ‘J’ai Donné Ma Langue Aux Chats’ reads the typography (I’ll leave you to translate). Different to the patronages of the Paris cafes, the piece here is at an artisan framer called Atelier Elio. If you’re in the mood for some Miss.Tic hunting there’s also local squares around the area too for chilling before continuing the chase.